Dear friends,Have you ever experienced a gentle warmth around your heart when someone appreciates you, or you express your appreciation and gratitude for others? This is just one of the many amazing properties of the powerful human emotion of appreciation. Bruce was a pretty happy fellow – loved his family, had a good job and nice place to live, but he felt overly stressed and wasn’t anticipating much improvement. He spoke with a friend and decided to try HeartMath’s practice of sincere appreciation. He went all out and began appreciating everything: people – personally and professionally; his surroundings; lunchtime, which he used to simply work through; he even started appreciating the food he ate. Most important, he started expressing his appreciation for the people he encountered throughout his day. Bruce said he was amazed at how much better he felt about himself and life, just by focusing on appreciation. He wondered if it could really be that simple. Stories like Bruce’s are quite common among the many thousands of people who’ve shifted their outlook by practicing HeartMath’s emotion-refocusing techniques. (Read about the benefits of sincere appreciation in An Appreciative Heart is Good Medicine. )Did you know? Heart-focused, sincere, positive feeling states boost the immune system, while negative emotions may suppress the immune response for up to six hours. These actual heart-monitor readouts contrast the heart-rhythm pattern of an individual experiencing frustration and then appreciation. The smooth heart rhythm, measured by heart rate variability (HRV), is what scientists call a highly ordered or coherent pattern and is a sign of good health and emotional balance. 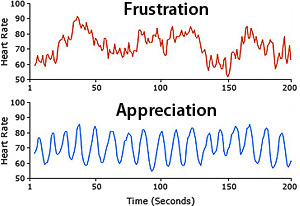 Repeated studies by the Institute of HeartMath show, individuals who intentionally focus on appreciation or other positive emotions can change their heart rhythm patterns from chaotic to smooth and rhythmic, like ocean waves. The marked change Bruce enjoyed is available to everyone who can spend a few minutes a day shifting their focus to sincere appreciation. To try a simple Appreciation Exercise,click here.